At least twice a day, Rafael Hernandez gets calls from desperate people. Their loved ones —- trying to come into the country illegally —- are lost in remote areas of the border. 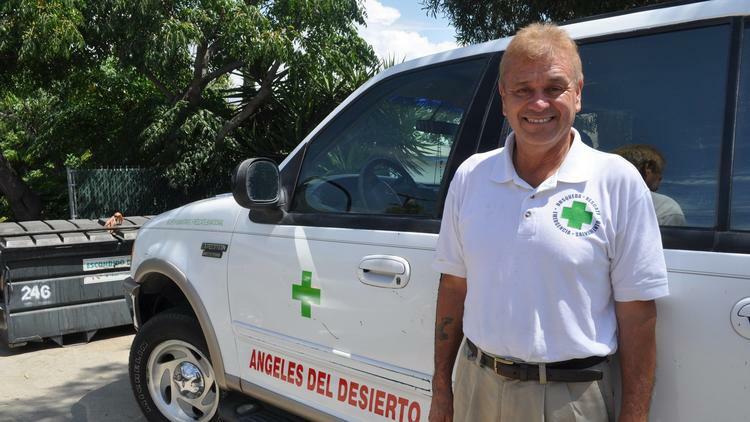 Hernandez heads a volunteer search and rescue group called Angeles del Desierto , or Desert Angels. His group has been involved in efforts to find several North County residents, including a Vista father who died in Arizona trying to come back into the U.S. illegally after being deported earlier this year. The work is dangerous, time consuming, frustrating and seldom rewarded with successful operations, Hernandez said. But the reason he has done it for 15 years is simple. “We try to save lives,” Hernandez said. The 57-year-old native of Mexico said he started the organization after seeing on the news a woman whose husband was missing in the mountains east of San Diego. Hernandez said he figured there would be many people searching for the man, but decided to go out and help, anyway. “I went to the mountains and to my surprise, there was nobody looking. Nobody. Absolutely nobody,” Hernandez said. He hired a few people who lived on the mountain and found the man, and Hernandez was hooked. Since he started the group, coming into the country illegally has become more dangerous because of increased security in urban areas, including San Diego County. The illegal immigrant traffic has turned east to the remote desert in Arizona, where about the bodies of about 200 illegal immigrants are found each year. One of the bodies found this year was that of Ildefonso Martinez Sanchez, 39, of Vista. The Vista father of five was deported in March after coming into contact with a Vista sheriff’s deputy at a local store. The deputy asked him for identification and called the U.S. Border Patrol after Martinez produced a Mexican ID card. According to Martinez’s family, he tried desperately to return several times, but died just north of the U.S.-Mexico border south of Tucson sometime after April 22, when he was last seen alive. Martinez fell ill after walking in the desert for more than a day, his wife, Juana Garcia Martinez, said. The smuggler and the rest of the group of about 20 illegal immigrants left him behind when he was no longer able to walk. One man, Isaac Jimenez Hernandez, stayed behind to help Martinez. He later walked about two hours looking for a cellphone signal to call for help. Jimenez made an emergency 911 call. When U.S. Border Patrol agents arrived, they told him other officers would look for Martinez, according to Martinez’s family. Two days later, Jimenez was deported to Mexico and called the Martinez family to tell them the story. Soon after, the family called the Desert Angels to help search for Martinez. Hernandez said he helped bring Jimenez, who was living in Tijuana, back to the Border Patrol in Arizona to help agents locate the missing man. Within hours, Jimenez led a Border Patrol helicopter search crew to the body on April 26, Hernandez said. By that time, the body was badly decomposed. Days later, the Desert Angels went to the site and placed a small wooden cross surrounded by water bottles. Gladys Dominguez, Martinez’ stepdaughter, said she was thankful for the assistance she received from the Desert Angels. Hernandez said his group is not always able to help. Only 2 out of every 10 calls he receives results in a search, Hernandez said. The main reason the group is unable to help people is lack of information about where to begin the search; often, people don’t know where their loved ones crossed the border, Hernandez said. The Desert Angels became widely known during the 2007 wildfires. The group found several people, including the body of a San Marcos man, near the top of Tecate Peak in East County, who died during the wildfires. Juan Carlos Bautista Ocampo, a native of Chiapas, Mexico, was crossing the border illegally, attempting to return to his home in San Marcos, when the Harris fire raged along the border near Potrero. The number of deaths along the border has increased since the mid-1990s, when the Clinton-era Operation Gatekeeper increased border security in San Diego County through the use of fences and Border Patrol agents. Immigrant smuggling routes were pushed farther east to Arizona and Texas. Hernandez said he has seen another reason for the deaths. In recent years, he said, many of the people he has searched for are people with established roots in the U.S., who have been deported and are returning to their families. In the vast Sonoran Desert south of the border, lucrative immigrant smuggling routes are controlled by drug cartels. The cartels charge illegal immigrants $3,000 to $5,000 to travel on roads to the border that they control, Hernandez said. Gunmen patrol the desert on behalf of the cartels, Hernandez said. The Angels of the Desert are largely allowed to do their work due to their reputation as a strictly humanitarian organization, but they are never completely safe, he said. The Border Patrol says it neither endorses nor condemns its work. Hernandez learned his search-and-rescue skills in his native Mexico City, where he worked as a firefighter and paramedic in the 1980s. He worked in a special unit that looked for lost hikers in the mountains near Mexico City, Hernandez said. In 1986, Hernandez moved to the U.S. after Mexico City was devastated by a magnitude-8.0 earthquake in 1985, he said. Now a legal resident, Hernandez said he worked for many years as a heavy-equipment mechanic until he decided to dedicate his life to his volunteer organization. The Angels of the Desert survives on public donations and assistance. Each Saturday, the man Hernandez calls his “right hand,” Miguel Jimenez of Oceanside, runs a small booth at the Escondido Swap Meet, where they collect donations. The group does not charge people for their help, Hernandez said. The group doesn’t help people come into the country illegally, Hernandez said. When members find someone who is still alive, they turn that person over to authorities, he said.